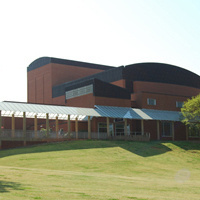 The Brooks Center for the Performing Arts is the home for the performing arts at Clemson University. 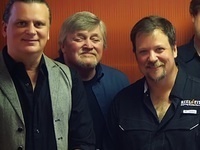 The state-of-the-art facility serves as a roadhouse to many nationally and internationally acclaimed dance companies, theatre troupes, and music ensembles of all types. The center is comprised of a 968-seat proscenium theatre that serves as the main stage, a 100-seat black box theatre, and a 100-seat recital room. National tours of Hairspray, Avenue Q, and H.M.S Pinafore have recently performed here. 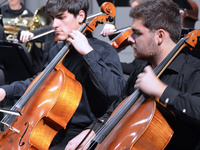 Other recent concerts include the Lincoln Center Jazz Orchestra featuring Wynton Marsalis, the Ailey II dance ensemble, pianist Lang Lang with conductor Christoph Eschenbach with the Schleswig-Holstein Festival Orchestra, the Eroica Trio, and the National Symphony Orchestra. 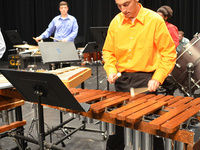 The percussion ensemble features contemporary drumming and percussion from around the world. Fantastic performance as always. The clemson Jazz band is fantastic! The Brooks Center is located at the intersection of Perimeter and Cherry roads on the Clemson University campus. Visitors to the Brooks Center may park in the lot directly east of the building. Orange painted parking spaces are available for all visitors, beginning at 6:00 p.m. White painted parking spaces (Patron's Row) are reserved for donors who annually give at the $500-level or above. Please note that towing commences two hours before each event for any unauthorized vehicle parked in a white space.